Over the years, I have figured out that sometimes we are more than just a dry cleaner. Sometimes, we are part of a story. Much of the time, our customers drop off their express bags with their everyday items. We clean and press their clothes with pride and care, and they return to pick them up. And we love doing that. But then there are the times, like this one, when the garment that is brought in is….well, so much more than your everyday khakis. I knew there was a story, and I just had to hear it. Steve told me that a customer brought in this dress. It was her grandmothers. She had just passed away. The dress was 70 years old and had been folded up and sitting in a box for years. He said that while it was in pretty good shape, there were a number of stains at the bottom. The family was just going to throw it away but the granddaughter wanted to save it in case her daughter or granddaughter ever wanted to wear it. As he does with every garment, Steve cleaned and pressed it with pride and care and returned it to the customer. We’re so pleased. The dress turned out beautifully. And someday when the daughter or granddaughter wears it, we will be part of the story. 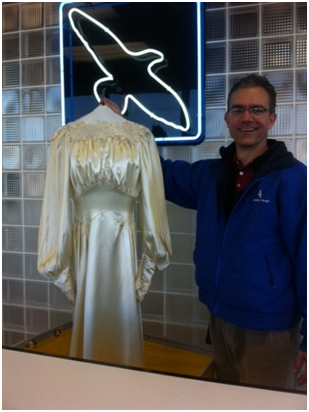 Thank you for your kind words and especially for trusting us to restore such a special dress.